While Chris Kimball tries to translate Cuban-Style Picadillo into a simple weeknight recipe, his recipe fails badly. I know Chris Kimball’s Yankee palate usually under-spices his Latin-themed recipes, but his problem in this case is that he seems more interested in attaining tender ground beef than developing the flavors by browning the meat. His trade-off left the recipe with bland, but tender, ground beef/pork. I recommend that you do not make this recipe. You will be disappointed. It is my lowest rated recipe in the past year. The leftovers sat in the refrigerator, until I got tired of looking at them and threw them away. A 2-1/2 star disappointment. Disappointing; but easy to make. While Chris Kimball recommends serving Picadillo with rice and black beans, and optionally topped with chopped parsley, toasted almonds, or chopped hard-boiled egg, I didn’t include any of that as the supposition was that this was going to be an easy weeknight meal. There is also a variation with fried potatoes. I guess the fried, diced potatoes might have helped the flavor. Start time: 5:00 PM. Dinner time: 6:10 PM. In a medium bowl, combine beef, pork, water, baking soda, 1/2 teaspoon table salt and 1/4 teaspoon ground black pepper. Allow to stand at room temperature for 20 minutes. Meanwhile, stem and seed you bell pepper and cut into 2″ pieces. Cut the onion in half and then into 2″ pieces. Process the bell pepper and onions separately if you have a small food processor. Pulse about 12 times until the pieces are chopped to about 1/4″. Place a large Dutch oven over medium-high burner, add 2 tablespoons vegetable oil and preheat until the oil begins to shimmer. Saute chopped vegetables, oregano, cumin, cinnamon, and 1/4 teaspoon salt for 6 to 8 minutes. While the vegetables cook, drain your tomatoes and chop them coarsely, and peel your garlic cloves. When the vegetables have begun to brown, press your 6 garlic cloves and saute them for 30 seconds, then add tomatoes and 3/4 cup wine, using the liquid to deglaze the bottom of the pot. Cook for about 4 to 5 minutes until it becomes almost dry. Add 1/2 cup beef broth, 1/2 cup raisins and 3 bay leaves bring up to a simmer, then reduce burner to medium-low. Add meat to the pot in 2″ chunks. Return to a simmer, cover and cook for 10 minutes, stirring occasionally and eventually using 2 forks to break the meat into 1/4-to-1/2″ chunks. Meanwhile coarsely chop your olives, and rinse your capers. 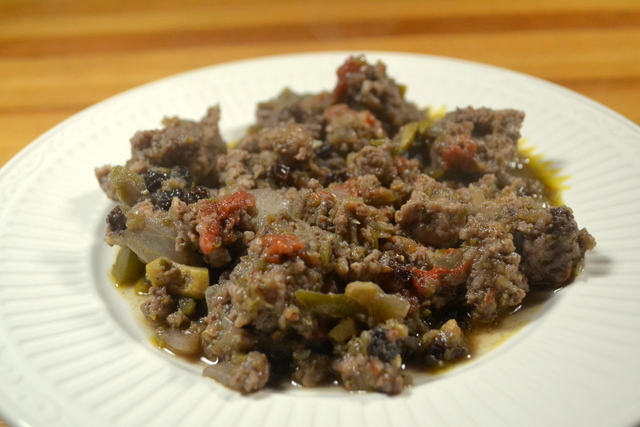 Remove and bay leaves, and add chopped olives and capers. Increase burner to medium-high and cook for 5 minutes. The sauce should become thick and should coat the meat. Add vinegar and adjust seasoning (salt, pepper and vinegar) according to your taste. Serve. I love hash browns, and at one point subsisted on them for more than a month. 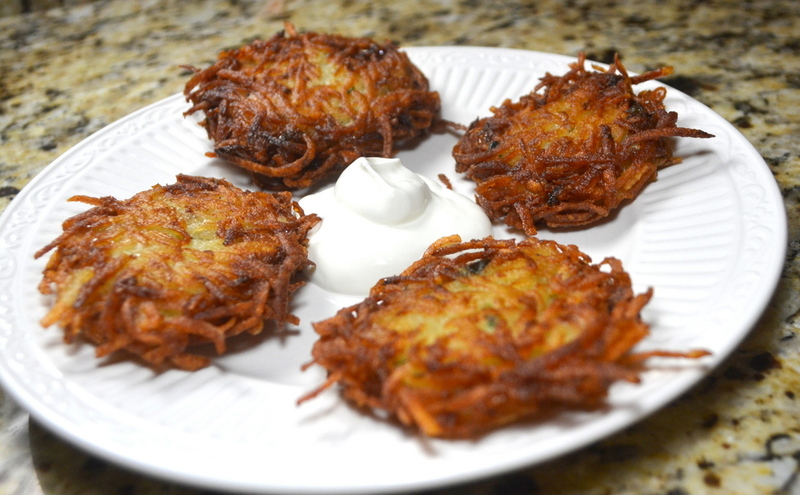 But I had never heard of Potato Latkes before I made this recipe; I think may be the same thing as Potato Pancakes. Whatever they’re called, the only real difference is that they use egg as a binder and include a 1/2 cup of grated onion. The Latkes themselves are delicious, 4-stars. Unfortunately, I was very unpleasantly surprised at the huge mess they made in my kitchen. It’s like Chris Kimball purposefully tried to use the greatest number of bowls and baking sheets possible; definitely not worth the cleanup. I froze the leftover latkes by loosely covering them with plastic wrap while they cooled for 4 hours at room temperature. Then I put them in a Zip-lock bag and froze them. Chris Kimball recommends reheating in a 375-degree oven for 3 minutes per side (for room-temperature latkes) or 6 minutes per side (for frozen latkes). How big of a mess? Huge. Start time: 5:30 PM. Dinner time: 6:30 PM. Scrub your potatoes and shred them, unpeeled, using the shredding disk of a food processor. Chris Kimball recommends cutting the potatoes into 2″ lengths. Set an oven rack to the middle of your oven, and pre-heat a rimmed baking sheet to 200-degrees. Add shredded potatoes, onion, and 1 teaspoon salt in medium bowl. Put half of potatoes in center of clean cloth dish towel. Gather together towel ends and twist to drain as much liquid as possible; allowing the liquid to drain into a measuring cup. Empty dried potatoes into a second bowl, then dry the reminder of the potatoes. Allow the reserved potato liquid to stand for 10 minutes, so that starch and water separate. Cover potatoes with plastic wrap and microwave for 1-1/2 minutes, stirring mixture with fork every 30 seconds, until warm but not hot. Evenly empty potato mixture over a second rimmed baking sheet. Allow to cool for 10 minutes. There is not need to wash out bowl. Pour off the water from reserved potato liquid, leaving only the potato starch in measuring cup. Add eggs and stir until smooth. Put cooled potatoes back in to bowl. Add minced parsley, 1/4 teaspoon pepper, and potato starch/egg mixture. Toss until everything is evenly combined. Place another wire rack over a third rimmed baking sheet. Line with a triple layer of paper towels. Add 1/4″ of oil to a 12″ skillet. Preheat over medium-high burner for 5 minutes until reaches 350-degrees (oil will be shimmering but not smoking). Measure 1/4-cup of potato mixture and place in oil. Push down with spatula until in becomes a disk 1/3″-thick. Repeat until 5 latkes are in pan. Cook for 3 minutes per side, until they become golden brown. 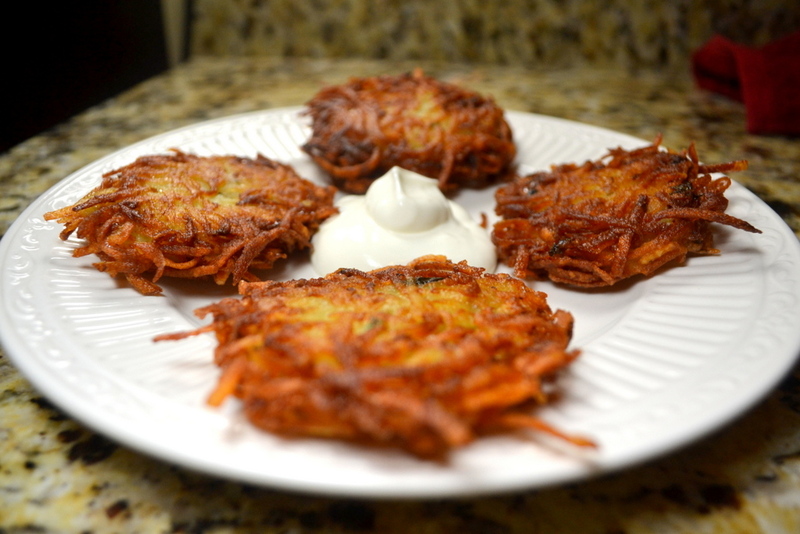 You may need to adjust the burner so that the latkes bubble around the edges. Remove to drain on paper towels, then place on baking sheet. You may been to add a little more oil to ensure you have 1/4″ depth, reheat oil to 350-degrees and repeat step 8 with the rest of the potatoes. Season with salt and pepper according to your to taste, and serve with sour cream. 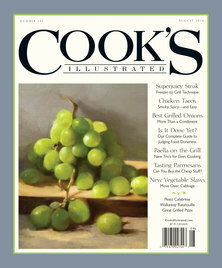 You are currently browsing the My Year Cooking with Chris Kimball blog archives for April, 2013.